Introducing Caspian, Hampton — an uncompromising collection of elegantly designed, generously proportioned residences, set right in the heart of Bayside. 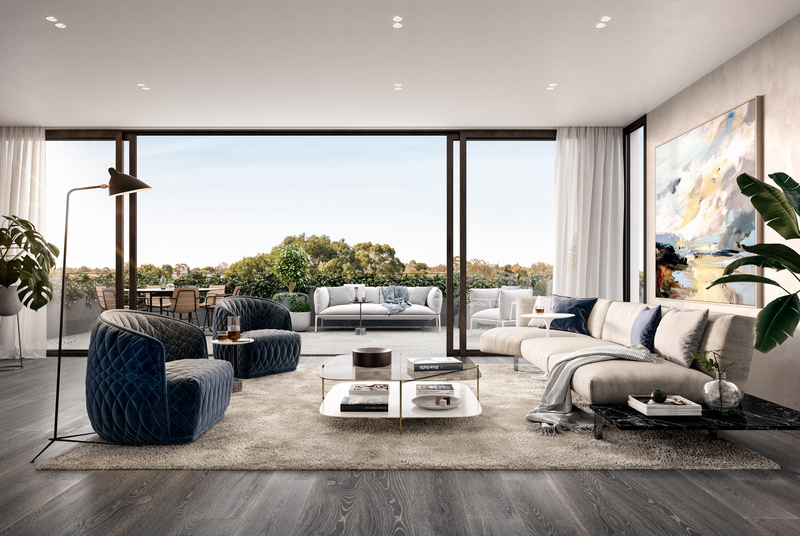 Occupying an expansive corner block, Caspian is a three-storey masterpiece brought to the market by Melbourne-based developer, Samuel Property — who have a real passion for developing considered, high-quality residences. Working in close collaboration with the team at Samuel Property, Bayley Ward architects have created an unsurpassed architectural structure by blending urban design elements with the leafy surrounds Hampton has to offer. Designed for locals who desire a home that exceeds expectation, each of these 2 and 3 bedroom residences offers generous, functional floorplans – with hints of class and practicality throughout. Market leading Wolf appliances and French Oak flooring will be standard through each home - together with an abundance of natural light, thanks to the enviable corner location. Elegant touches of aged brass and natural stone appear through accommodating kitchen spaces, while the thoughtful inclusion of a butler’s pantry demonstrates design paired with functionality. These finer details are a testament to an experienced team who know how to transform a home from just a series of ‘rooms’ into a luxurious and refined space in which to live and enjoy effortlessly. Residents can prepare for the day ahead in bathroom spaces that are a true example of stunning, innovative design. In ensuites spaces throughout, staggered tiles frame a feature stone wall. Lit from above by LED lighting or skylights on the upper floor, the oval freestanding bath becomes a real focal point of the room. These spaces are no longer purely functional, they are a private oasis in which residents can relax and unwind at the end of each day. Owners on the ground floor will have exclusive private access via the Gillies Street frontage, as well as beautifully manicured gardens by renowned landscaper, Jack Merlo. Designed with low maintenance in mind, the carefully considered terrace and balcony spaces will be sure to impress through all seasons. As another unique feature, Samuel Property has incorporated a private wine room into the lowest floor of the building. A peaceful hideaway to meet and share a glass or two with neighbours and friends alike. Each residence at Caspian will include its own private wine storage facility. Outside of home, owners will find urban amenities in the charming tree-lined streets of Hampton. Surrounded by both period homes and cutting-edge modern residences, an array of boutique cafes and fine dining options can be found scattered along Hampton Street. Sparkling ocean meets Hampton beach only 900m away, while a short 3km further, Brighton offers further stretches of beautiful sandy shoreline. After wading in the cool water, locals can work on their skills at the Brighton Golf Club or play a game of doubles at the Hampton Tennis Club. With Caspian as home, the entertainment options are endless. Only 14km from Melbourne CBD, residents of Caspian are well connected to Australia’s most liveable city by train or car, whilst the beautiful shores of Mornington Peninsula remain close enough to explore after work or over the weekend. Designed with graceful and flawless attention to detail, Caspian sets a new benchmark for contemporary and intelligent living in a prestigious Bayside location. Enquire now to find out more about this limited collection of luxury residences at Caspian, Hampton.